US using illegal mercenary forces in Pakistan? The use of mercenaries or mercenary-like private armed forces by the US is forbidden by Anti-Pinkerton Act of 1893 (5 U.S.C. § 3108). See Weinberger v. Equifax, 557 F.2d 456, 462 (5th Cir. 1977), cert. denied, 434 U.S. 1035 (1978). The use of mercenaries is forbidden under international law by the International Convention against the Recruitment, Use, Financing and Training of Mercenaries. I am the former senior systems administrator for One Laptop per Child (OLPC). I am speaking only for myself. When I worked for OLPC, it had about 23 employees. How do you realistically propose that we would have provided individual training, “One Trainer per Child” as you put it, to over 700,000 users? That is the job of the country or nonprofit managing the deployment, not OLPC. OLPC has not been a failure, not withstanding the vitriolic opinion on one blogger on a private .com website covering the UN (not a “UN-based blog”). Each country and region has its own culture and pedagogical standards and methods. OLPC cannot dictate to Mongolia, Peru, Uruguay, Nepal, etc. how they should use the laptops or how they should teach. There are no American customers aside from some local deployments. The Give One, Get One promotion ended nine months ago. Did you not know this? You say that several thousand orders have been reported lost or stolen. Where and when? If this happened, how is it the fault or responsibility of OLPC? Why are you so hostile and ill-informed toward such a wonderful and brilliant program? You could do better, I suppose? I am very proud of the time that I spent at OLPC, and I have never met a more brilliant, caring, hard-working, and committed group of people anywhere. They, and the world’s children, deserve better from you. I will be posting this letter, and your response should you care to provide one, on my blog at https://scanlyze.wordpress.com . Undispatch, which says it receives part of its funding from the United Nations Foundation, has published an attack on the One Laptop per Child project on its website titled “One Laptop per Child – The Dream is Over” at http://www.undispatch.com/node/8859. The blog, which says it is by Alanna Shaikh, makes several criticisms of the OLPC project. I served as systems administrator for OLPC from February 2008 until January 2009 and continue to volunteer for the project because I think it is one of the most wonderful and laudable development projects ever attempted, despite the many setbacks and disappointments it has endured in trying to fundamentally change world-wide education, development, and the laptop market. I wrote a response to UNDispatch two days ago on their blog site. My response did not appear. I wrote to UNDispatch to ask for them to approve my post, and provided them with a copy. It still did not appear. A response from OLPC Chairman and founder Nicholas Negroponte was published on the UNDispatch site today. This blog post makes several questionable and false statements. And it has a generally nasty and condescending tone which makes me rather sad. OLPC did not “abandon” human power sources, however conventional wired electricity, generators or in some cases, solar power are much more efficient. Making children do hard physical labor to power their computer is not such a great idea. The hand crank was fragile and did not provide enough power. However, foot-treadle devices such as can be used to power a truck battery work reasonably well. OLPC has not “abandoned the special child-friendly OS”. It has shipped approximately 700,000+ units with Sugar and perhaps 7,000 with Windows (my unofficial estimates). OLPC has provided funding and support for SugarLabs to continue this free software development work, and Sugar is available as a desktop on any Fedora or Red Hat desktop post Fedora 10. The number of XO laptops sold for poor countries is about ten times the total number sold though the several “Give One Get One” promotions in North America and Europe. The idea that the laptops were developed without end user input is patently false. 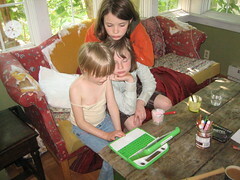 There is an active and vocal community of OLPC users thoughout the world who participate — see http://wiki.laptop.org/go/Participate through the OLPC wiki at http://wiki.laptop.org and many locally-based organizations. Among these are Plan Ceibal in Uruguay, Open Learning Exchange Nepal, and OLPC Rwanda. A partial list of regional groups can be found at http://wiki.laptop.org/go/Regional_groups . There are many local grassroots small deployments in dozens of countries. Last night at the Berkman Center for Internet and Society Open House we heard about a local grassroots deployment in Haiti spearheaded by Kevin Wallen(sp?) and Helene Dietrich(sp?) and the tremendous empowerment and social transformation and pride it has brought in that community. The phrase “to call a spade a spade” has rather unfortunate racist connotations and seems singularly inappropriate on this UN blog. OLPC pioneered the netbook market. It has set an unequaled standard in simplicity of maintenance, low power consumption, ruggedness and durability, high quality screen, long-range dual wireless capability, use of free and open source software, and openness to community collaboration. Designing and developing the hardware, software, applications, distributing the computers, and coordinating the hundreds of local initiatives was done by no more than 23 employees (at one time) including me. Hundreds of volunteers work on the OLPC project through developing applications, answering end-user tickets via the support gang, helping administer the back-end infrastructure through the Volunteer Infrastructure Group and many other initiatives. The XO has brought joy, pride and a window on the world for hundreds of thousands of children in poor and working class communities throughout the world. Although I left OLPC in January, I am very proud of the work we have done and consider the year that I spent there as systems administrator to have been the high point of my life intellectually, educationally, and morally. I am the former senior systems administrator for One Laptop per Child. I am writing to draw your attention to a very problematic post appearing on your site, “One Laptop per Child – The Dream is Over”. I posted a response and correction two days ago, but your moderators have not yet approved it. So it is very disappointing to see such a vindictive, hostile, and inaccurate report appearing on a blog financed at least in part by the United Nations Foundation. I look forward to my response as submitted two days ago being approved and appearing on the site today. As of this posting, I have yet to receive a response from UNDispatch or to see my response posted on their site. Could One Laptop Per Child be a bad thing?